Two Bay Area newlyweds returned from Paris and are speaking out after they spent the last night of their honeymoon there when the terror attacks unfolded saying they're lucky to have made it home alive. SANTA ROSA, Calif. -- Two Bay Area newlyweds who returned from Paris are speaking out after they spent the last night of their honeymoon there when the terror attacks unfolded. Santa Rosa residents Jamie and Shane Keck-Crozat weren't sure if they would make it home alive after the Paris attacks broke out during their honeymoon. 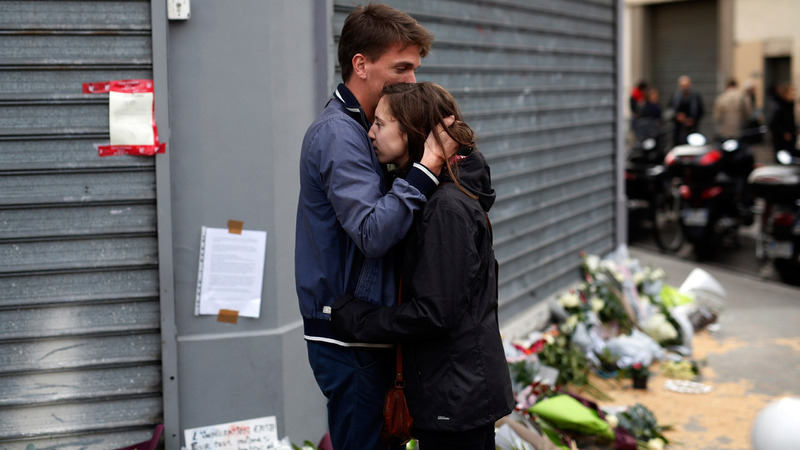 "It almost feels selfish in a way to be here and not be able to mourn it with people who fully understand the terror of what was going on," Jamie said. The couple returned home Sunday after a two-week dream honeymoon in France. "They were throwing grenades into restaurants and shooting into restaurants and because we were so close to the area not knowing if the terror was done," Jamie said. "We definitely feared for our life," Shane said. Shane and Jamie were having dinner with two friends at a small Paris restaurant just two blocks away from the Bataclan Concert Hall where terrorists killed hostages. The couple took a photo of cafe owners telling patrons to stay calm. "They said 'We can't let anyone leave, we're on lockdown,' and they immediately closed all the curtains, locked the doors," Jamie said. "People are crying, people are upset visibly and emotionally you can see the tears, maybe they knew someone at the theater or maybe they knew somebody at the soccer stadium," Shane said. Three hours later, the couple set out to try and get back to their hotel. Shane was fearful they wouldn't make it. "It's the fight or flight theory, you know like I need to protect myself, I need to protect my wife," Shane said. "People running, there were cops everywhere," Jamie said. They arrived back to their hotel three hours later and set off for the airport the next morning where they found massive crowds and chaos. Now that the couple is finally back home, they realize from news reports how much danger they were in and how lucky they were to make it through. "Our hearts are going out to other people that maybe weren't so lucky, who were at the wrong place at wrong time," Jamie said.